Directed by David Bear, The High Point Pittsburgh Investigation is exploring the possibilities for transforming the flat, one-acre rooftop of the 64-story U. S. Steel Tower, Pittsburgh’s tallest building, into a publicly accessible, self-sustaining, four-season facility that will contribute to civic wellbeing while also demonstrating cutting-edge sustainable design and technology. Envisioned as a “built environment” and a “Viewseum” that will attract a steady stream of visitors from near and far, High Point Pittsburgh will incorporate green building design and construction techniques to minimize its energy requirements; employ sustainable plantings and design features to mitigate rainwater run-off; harness wind power and solar energy to produce usable electricity for itself and the building; and generally serve as the epitome of energy and environmental awareness. Equally important, by generating revenue to pay for its construction and fund its on-going operations, High Point Pittsburgh is envisioned as being a financially self-sustaining entity. Below is a 90-second video tour of the proposed facility. 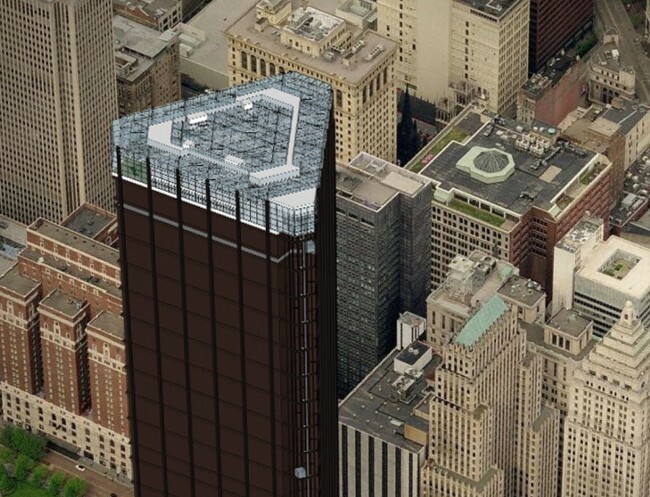 You can also tour High Point Pittsburgh in this virtual simulation. During the project Bear has also worked with individuals from the CMU Create Lab and the Pittsburgh Supercomputing Center to create the Pittsburgh Gigapanorama, an interactive, 10.49 gigapixel image that captures the full 360-degree vista from the top of the U.S. Steel Tower. These efforts have evolved into the Pittsburgh Gigapanorama Project, an ongoing exploration of this new form of urban portraiture. High Point Pittsburgh was supported by the Steinbrenner Institute, the Buhl Foundation, the Heinz Endowments, the Sprout Fund, and The Pittsburgh Foundation.